measures a whopping 163 x 343mm (484mm long with the lens hood fitted) and tips the scales at 3.85kg. It's supplied in its own custom-made hard case that, in itself, exceeds the maximum carry-on size for most airlines. Indeed, you don't fit this lens to your camera, you fit the camera to the lens. But sometimes, big really is beautiful. 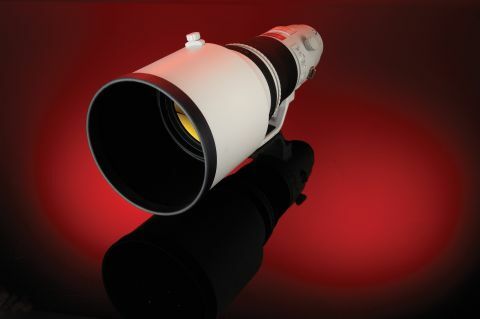 A scaled up version of the Canon EF 300mm f/2.8L IS II USM super-telephoto lens, the 400mm offers the same wealth of features. Designed for full-frame DSLR camera bodies such as the Canon EOS 1Ds Mark III or Canon EOS 5D Mark II, it's also equally compatible with APS-C-sized cameras such as the Canon EOS 7D, where it has a mighty effective focal length of 640mm. In either case, the fast f/2.8 maximum aperture is a real bonus for freezing the action in dull lighting conditions, making the lens ideal for wildlife and sports photographers. Headline attractions include super-fast, ring-type USM (Ultrasonic Motor) autofocus, complete with full-time manual override. Better still, you get an additional Focus Preset mode where you can store a focus distance in memory and call it up at the touch of a button, with or without confirmation beep. There's also a neat Power Focus mode with its own 'Playback ring'. Turning the ring by varying amounts enables dual-speed motorised focus adjustments, ideal for use in video shooting. There's also a three-position focus limit switch with Full, 2.7-7m and 7m to infinity options. To guard against camera shake, Canon's latest 4-stop Image Stabiliser (IS) has three separate modes to choose from. Mode 1 stabilises the image full-time, so you can view the effect through the viewfinder when composing shots. Mode 2 is for panning with the camera in either portrait or landscape orientation. Mode 3 only applies stabilisation when the shot is actually taken, and works really well when you're tracking erratically moving objects. Rounding out the feature set on this high-end camera lens, currently selling for around £8,880, are four AF stop buttons placed at 90-degree increments around the circumference of the lens, towards its front. If you're not happy with their placement, you can pay to have the ring that houses them rotated by a Canon service centre. There's also a Kensington lock attachment for securing the lens, a beefy tripod mount and somewhat enormous lens hood.